Seems Escape Music is expanding their talent roster, or at least thinking outside the box, by signing Invictus, a French power metal band. Signing a French band may be a first for the label. But some (RockReport.be, for instance) are saying that adding a power metal band is out of character for them, a label that has established itself upon AOR and melodic hard rock talent. This may be true if you believe that Invictus is power metal band in the classic sense. After a spin through their second release, Persecution, I have my doubts about their classification and the conclusions of certain pundits. I think Invictus is a perfect fit for Escape Music. Overall, Invictus's Persecution is a better than average disc of eclectic melodic metal which integrates many styles and keeps you guessing along the way. Some may call this artistic confusion, a band not knowing which musical road to travel, and so find Persecution a frustrating listen. Conversely, though I did not find any song exceptionally brilliant or memorable, they were all intriguing; and Invictus is light years ahead in creativity than many of their peers. Recommended! 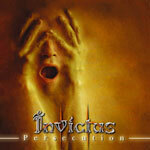 Invictus's Persecution is a better than average disc of eclectic melodic metal which integrates many styles and keeps you guessing along the way. Though I did not find any song exceptionally brilliant or memorable, they were all intriguing; and Invictus is light years ahead in creativity than many of their peers.